NOTE: All electronic invitations must be approved for content by university relations. 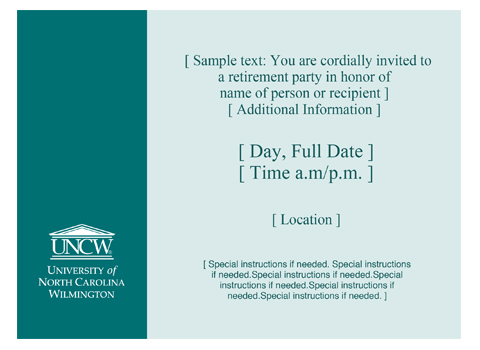 Once you have edited the downloaded PDF invitation, save as a .jpg file and forward the final draft to OUR@uncw.edu with a subject line of APPROVAL. Please allow 7-10 days lead time. Open in Adobe Acrobat Pro. Apply text in desired fields. Save document as a jpg. Embed into an HTML email using Outlook or Entourage.